Premium Wild Alaskan Salmon Oil for Dogs and Cats ★ All-Natural Omega-3 Food Supplement ★ over 15 Omega's ★ EPA - DHA Fatty Acids ★ Natural Astaxanthin - Vitamin D ★ Satisfaction Guaranteed! TerraMax Pro's Premium Wild Alaskan Salmon Oil is the highest quality fish oil you'll find anywhere and an excellent natural source of Astaxanthin, Vitamin D and 15+ Omegas. Carefully crafted from Wild Alaskan Salmon and molecularly distilled for purity from all toxins, it's refined for maximum potency. 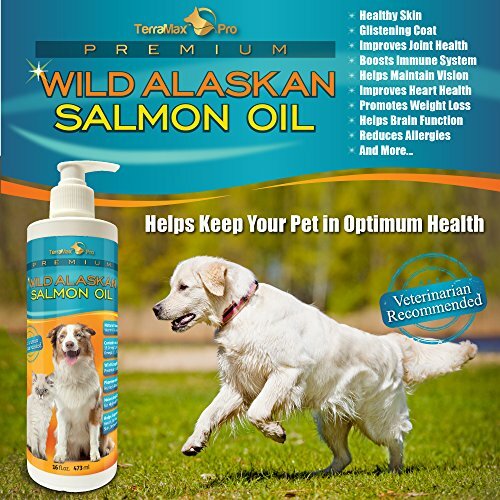 TerraMax Pro's Premium Wild Alaskan Salmon Oil is guaranteed to contain 100% of the purest, most potent salmon oil on the market to provide optimum nutrition for your pet. Our salmon oil is all natural and does not contain additives or preservatives. Try it now, keep your pet active, healthy and happy! Click the Add to Cart button above to improve your pets quality of life! ✚ MOLECULARLY DISTILLED FOR HIGHEST PURITY. One of the only purification methods that can remove heavy metals, PCB's and other toxins to below detectable limits for human consumption. 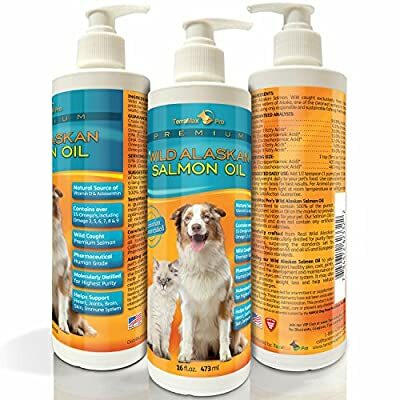 Our Salmon oil is independently tested at a 3rd party laboratory for over 250 contaminants and is Certified Mercury free with no detectable levels of PCB's, heavy metals, pesticides & dioxins. ✚ 100% SAFE AND ALL-NATURAL. Wild caught exclusively from the clean waters of Alaska using only sustainable and responsible fishing methods. NO fillers. NO binders. NO artificial ingredients. Just 100% of the purest, most potent fish oil on the market, ready to help improve your pets health. TerraMax Pro's Wild Alaskan Salmon Oil is an excellent source of essential fatty acids EPA and DHA. Not only does it include Omega 3 6 9, it has over 15 different Omega's, including 3-5-6-7-8-9 and is an excellent natural source of Vitamin D and Astaxanthin. ✚ PHARMACEUTICAL HUMAN GRADE SALMON OIL. What other companies don't tell you could be poisoning your pets! The source of your fish oil matters. Other fish oil often contains Mercury, PCB's and other toxins from nuclear fall out or other sources. Our fish oil is carefully crafted from Wild Alaskan Salmon, caught exclusively from one of the cleanest waters in the world and molecularly distilled for purity from all toxins, surpassing the standards set by California Proposition 65 and all US and European Pharmacopeia standards. ✚ VETERINARIAN RECOMMENDED. 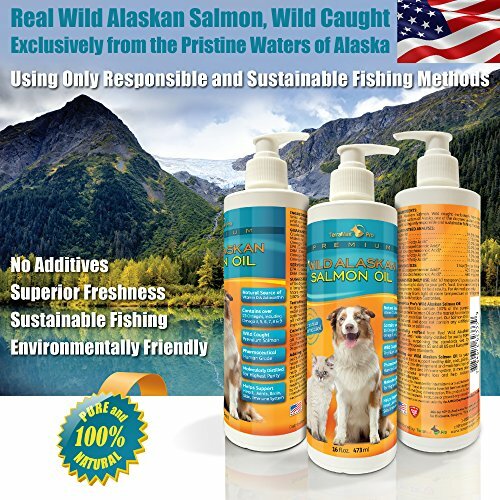 Premium Wild Alaskan Salmon Oil has been recommended by veterinarians for cats and dogs of all ages, sizes, breeds and activity levels. Adding TerraMax Pro's Premium Wild Alaskan Salmon Oil as a treat to your cat or dog food helps support healthy skin, coat, joints, cardiovasular health, nervous system and the development and maintenance of the brain, eyes and immune system. It may also help promote weight loss and help reduce certain allergies and yeast infections. Great gift idea for anyone with pets! ✚ TRY IT RISK FREE WITH OUR UNCONDITIONAL 100% SATISFACTION GUARANTEE! We're so confident you're getting the purest and highest grade salmon oil available anywhere, we'll let you try it absolutely risk free! Use the entire bottle and if you're not absolutely thrilled, you get all your money back. No questions asked! If you're serious about your pet's health, click the Add to Cart Button Now! You're covered by our unconditional satisfaction guarantee!